VoiceGear Phone System is built upon open standards by combining the power of VoIP technology with the reliability of our specialized telephony hardware in a compelling package tailored specifically to SMB. By investing in VoiceGear you are purchasing an award winning communications system which will help keep your employees in touch, your customers happy and your business growing. VoiceGear transforms your phone system into an IP-based unified communications tool combining office phones, mobile smartphones, fax, email, and Skype in a single solution. The system brings together your office staff, sales people on the road and employees working from remote offices to help capture leads, close sales, increase client satisfaction and improve business productivity. VoiceGear has earned an outstanding reputation for maximizing efficiency, streamlining operations while keeping your operations costs to a minimum. VoiceGear Phone System Standard has been specifically designed to accomodate SMB and grow together with your business. VoiceGear Phone System enables your company to migrate to cost effective VoIP communications while keeping your existing contact numbers and traditional phone service quality and reliability. VoiceGear Phone System Standard is able to automatically failover to traditional phone lines in the unlikely case your Internet connectivity is down. Using VoiceGear in your business can reduce your telecom infrastructure costs and operating fees by up to 60% as compared to traditional phone service and long-distance providers. *Requires VoiceGear Connect Skype gateway integration. VoiceGear Phone System Standard is an ideal solution for businesses or branch offices with 250 employees and under. In addition to reduced phone call costs and other expense saving features, VoiceGear Phone System will also make your business more efficient. With support for variety of auto-attendant options, voicemail, call queues, follow-me calling and remote extensions your employees will be more productive and your customers will be impressed with the level of service they receive. VoiceGear Phone System is perfect for companies with multiple locations, remote employees, or customer-centric organizations looking to bridge the gap between the company and their customers, both domestically and internationally. Simply install multiple VoiceGear Phone System appliances in each branch office location, take advantage of FREE calls for all intra-office communications and allow incoming callers seamlessly reach any office regardless of location. 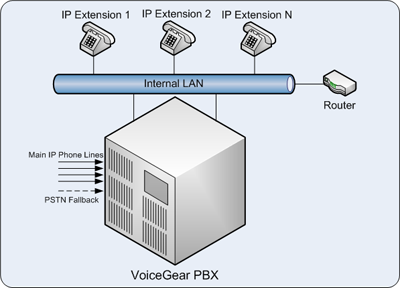 After connecting the VoiceGear Phone System to power and Internet you can access the centralized web interface similar to that of a router. Using this intuitive UI, you can configure phone service and create extensions for your employees using local resources while at the same time having access to the VoiceGear support team for advanced troubleshooting. This approach significantly cuts down on the maintenance costs without sacrificing system uptime and problem resolution. VoiceGear Phone System Standard offers a multitude of features targeted towards reducing communication costs as well as increasing productivity of your office employees. With a click of a button, you can activate a powerful directory feature which will allow external callers to browse you staff directory and locate necessary extensions by simply spelling their last names on a touch-tone keypad. Every VoiceGear Phone System Standard comes with over 2,000 hours of voicemail storage which can be assigned to any connected phone and personalized for each user. Stored voicemails can be accessed via an online interface, any office phone or automatically sent by the system as email attachments. By deploying VoiceGear Phone System, your organization automatically gains a conference bridge with advanced conferencing capabilities. Using the built-in web interface, any user can setup conference rooms and host conference calls between internal and external callers alike and avoid using expensive conference services. Conferences can be configured in lecture or open discussion modes as well as recorded on demand. Allow callers to find you and your staff even when they if you are not at their desks. Whether you are on the road, at home, or on a business trip, follow me feature will forward incoming calls and locate you wherever you are, based on call forwarding rules you create. With the VoiceGear Phone System, your extensions are no longer tied to your desk. You can take your phone and use anywhere with an Internet connection. You can setup virtual extensions at home or at branch offices. You can use SIP soft phone on your laptop to connect to your extension in the office.